It has been an amazing seven weeks of making connections between two countries that on the surface seem to have very little in common. We've connected countries as diverse as Malaysia with Sweden and the Ivory Coast with Canada. With your help, we even managed to connect Panama with the United Arab Emirates. Well, for our eighth and final set of countries, we've chosen South Korea and Poland for our segment "Global Connections." Despite still technically being in a state of war, South Korea is currently one of the leading economies in the world and exports some of the world's most popular electronic and automotive brands. Samsung, LG and Hyundai are all brands that came from South Korea and are popular in many countries in the west. South Korea is also well-known around the world for its cuisine with dishes like kimchi becoming staples in many countries. 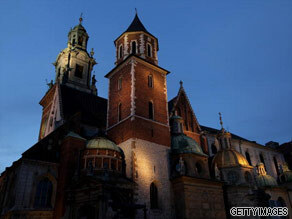 Poland has also seen a resurgence in their economy and has quickly become one of the powerhouses in eastern Europe. Can you connect Poland to South Korea? If you think you know your stuff for both countries, you can also try your luck on this week's quiz by clicking here. You can also leave your comments on our brand new Facebook fan page - just visit www.facebook.com/CNNconnect for behind the scenes photos, special interviews and even a tour of the CNN London bureau! Nelly Furtado is one of Canada's biggest pop stars and has sold more than twenty million records globally. Nelly Furtado is your Connector of the Day. Furtado first broke onto the music charts in 2000 with her debut single titled "I'm Like a Bird." The song quickly reached number one in Canada and peaked at the number nine spot on the Billboard charts. She was awarded the 2001 Juno award for single of the year and in 2002 went on to win the Grammy award for best female pop vocal. Furtado, who was born to Portuguese parents in Victoria, British Columbia took a brief break from the music world to have a daughter named Nevis. After a second album which didn't have the same success, her third album called "Loose" was released in 2006 and became one of her most popular albums. Songs like "Promiscuous", "Maneater", "All Good Things Come to an End" and "Say It Right" were all top selling singles. Last year, Furtado released her Spanish album called "Mi Plan." Most recently, Furtado was applauded in her home country for her performance during the opening ceremonies of the 2010 Vancouver Olympic Games. Condoleezza Rice's personal memoir of her family history called,"Extraordinary, Ordinary People," hit book stands earlier this week and recalls much of her family's time during the Civil Rights era in Birmingham. Condoleezza Rice is your Connector of the Day. 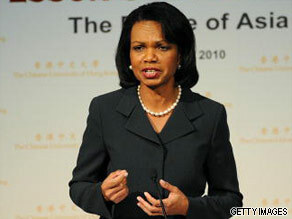 Rice has said that she will write a memoir about her eight years in the White House but felt she could not do so until people understood the "personal and implausible journey" she had taken from being born in 1950s segregated Alabama to being named the first female African-American to lead the State Department. All of this happened, Rice said, due to her parents, John and Angelena Rice. A guidance counselor/preacher and school teacher respectively, Mr. And Mrs. Rice never made more than $60,000 annually, Rice said. Despite being raised in a city resistant to quality education for blacks, Rice's parents used their meager resources to provide their only child with piano lessons at 3. She also took French and ballet. She never learned to swim as a child because Birmingham Public Safety official Eugene "Bull" Connors forbade blacks and whites from sharing public swimming pools. But Rice's parents refused to let the racial tensions limit her potential. "Even if I could not have a hamburger at a Woolworth's counter, my mom taught me that I could be President of the United States," Rice said at an author panel during the 10th annual Book Expo America in May. Rice was one of the most powerful women in Washington serving as both Secretary of State and National Security Advisor. Here's your chance to send in your questions to Condoleezza Rice. Do you want to know about her family history? Are you interested in asking her about her time in Washington? Please leave your questions below - you can also send them in via Facebook at www.facebook.com/cnnconnect or on Twitter @BeckyCNN.